After finishing my Master’s Degree in December. I have returned and settled in Hertfordshire where I am currently developing and investing in my workshop. I aim that by September 2006 I will have a fully running small set-up enabling me to continue and develop my art work in my own time. After nearly 2 years, I have just finished assisting at Nick Allen’s Glass department due to their imminent move to Sussex, I would like to thank Nick Allen and Sarah Deal for the experience I have gained with them and wish them all the best for their move and the future. The International Festival of Glass is taking place this year in Stourbridge,, where two pieces of my work, “the perfect home” and “Family Time” will be exhibited in the British Glass Biennale which takes place along side of the festival from 25th August to 17th September. See www.ifg.org.uk for more information. I have just started a collaboration of works with Textile artist Caren Garfen. Our works go well together marrying the same themes and ideas. 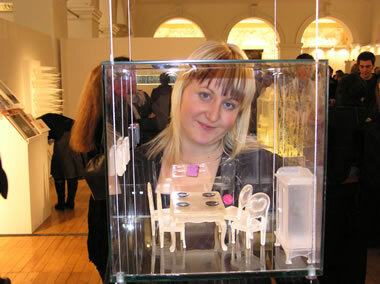 I am very exited to juxtapose my cast glass objects with Caren’s delicate and skilled embroideries. We are looking to launch our joint works at the end of 2006.